You stand there, staring at the microphone in fear. There are people beside you, behind you, all around you; in front, a seeming sea of faces, all looking at you, hungry, like lions in the arena… Struggling to shake off that image, yet frozen to the spot, you open your mouth to speak. “I… have received… I… I…” – Whatever you do, no matter how hard you try, the words just will not come. And though no-one says a word in return, you feel their disappointment, and your shame… that crushing sense of failure that follows you everywhere. This is the opening scene of the film The King’s Speech, of course. It’s the opening scene to storytelling in the big-S sense – a big story, full of colourful characters such as Britain’s King George VI, his wife Elizabeth, and the eccentric yet effective speech-therapist Lionel Logue. But behind this Big Story are a myriad of much smaller, more intimate stories, like that incident above – and without them, the big story wouldn’t exist. When we talk about story and the Zahmoo story-bank, some people think that it’s only for Hollywood-style big-S storytelling – all the complexities of three-act structure, the Hero’s Journey pattern, character-arc and the rest. And yes, it’s true that you can use Zahmoo to support that kind of storytelling. Yet its real purpose is to support small-s storytelling – the small everyday stories that matter so much to families, to communities and to business. And, usually, some kind of ‘punch-line’, a meaning or lesson-learned – in that incident, a painfully real illustration of how it feels to be unable to express ourselves in front of others. Those personal details are what anchor the story, and make it so real. That’s why those small stories matter – and why it’s worthwhile managing those stories in a story-bank. And, if we want, we can use stories from this small-s storytelling to underpin big-S storytelling. To do that, we’d change some of the details of a small story, or leave them intentionally ambiguous – as in that opening story above, in which anyone with a fear of public-speaking could place themselves all too easily. We’d change the people in each small-story, to match our made-up characters; and we’d then weave those amended small-stories together, using the three-act structure and suchlike, to make our larger story. That’s how every Big Story works. Big-S storytelling, small-s storytelling: they’re related, but they’re not the same – and, in your Zahmoo story-bank, it’s the small stories that’ll matter most. 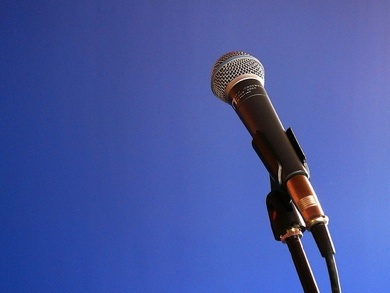 Image credit: Microphone by Hidde de Vries under a Creative Commons BY-2.0 licence. Whether family, community or business, every group seems to develop its own special jargon, terms and catch-phrases. It’s part of how we each identify as a member of that group: to know what something means, we need to be ‘in the know’. And sometimes the phrases are intentionally obscure – such as in those seemingly-impenetrable acronyms above. FHB? It meant ‘family hold back’: she knew all too well how greedy we kids were, so wanted to make sure that our guests had a chance for at least some of those so-special strawberries! A stern “FHB!” across the meal-table would remind an erring child to hold back before the damage was done – and, we would hope, without the guests being any the wiser about what was actually going on. And HEC? The archetypal English ‘ham egg and chips’: it’s what we both so often order, at our meal-time meetups, that it’s become a kind of code for the meeting itself – and to ‘outsiders’ makes the planned meeting seem much more serious and formal than it actually is. Which all works well for those at the time, of course. Yet if we’re collecting stories for our story-bank, it can make things a lot more difficult – especially in family-history and community-history, where memory fades over time, and there’s a real risk that the meaning will be lost. And as you capture the story, watch out for any jargon or special-meanings in the midst of the story. If you’re doing this in real-time – capturing it on the spot with a voice-recorder, for example – don’t interrupt the flow of the story, of course. But do remember to ask the interviewee afterwards about any special terms whose meaning wasn’t clear – or whose meaning may become less clear over time, or to ‘outsiders’. If it’s an old family story, or community story, ask around: with any luck, there’ll still be someone who can remember what that phrase meant. But don’t miss this step – otherwise that special meaning may well be lost forever. 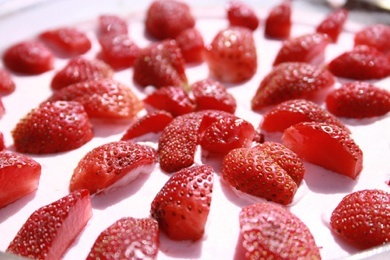 Image credit: Strawberries by Asha Susan under a Creative Commons BY-ND-2.0 licence. With just a few words, or pictures, we can imagine ourselves into some other place, separated from us somehow by time or distance. A memory of a quiet morning walk along a quiet quayside, perhaps. In that sense, our stories can anchor us in place, time, context. Yet although the real anchors there are the facts of the story, those things that we experience as facts – the boats, the smell of the sea, the clink of the rigging, seagulls squabbling over some scraps of fish, the gentle whisper of small waves rippling below us along the quay-wall – the facts alone are not enough. The story comes from how we link these facts together – how we perceive it as a whole, as a story. An anchor isn’t much use without the anchor-chain. It’s not only the images or words, then, that make a story – that anchor us in the story. A comment from Christina Baldwin might help here: “Words are how we think; stories are how we link”. Think, perhaps, of some of the metaphors we might use here: we’d talk about weaving a story, a thread of conversation, a chain of reasoning. It’s all about links, connections; meaning that arises from those connections, and because they connect. Use these tools within Zahmoo to help you manage your stories: those connections are the anchor-chains for the anchors of your story. 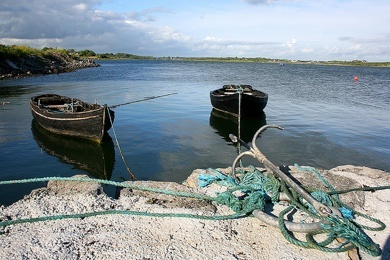 Image credit: Anchored, I think by Eoin Gardiner under a Creative Commons BY-2.0 licence. 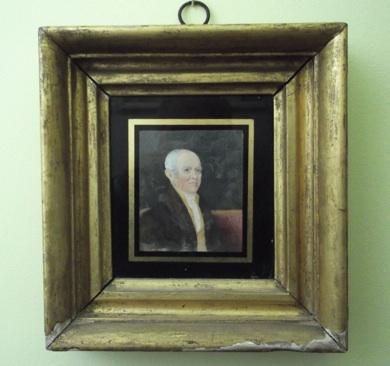 This small portrait of one of my English ancestors now hangs on the wall halfway up the stairs at my mother’s house. The formal clothes and the overall style place him around the 1830s or 1840s – a time when the excesses of the Regency were fading, and when public principles once again began to matter more than private profit. Just when the Committee was getting bogged down in detail, John Mann, Labour MP for Bassetlaw, cut to the quick. “Can you remind me the three founding principles of the Quakers who founded Barclays [in the 1690s]?” he asked Bob Diamond. Whatever the real rights or wrongs in that specific case, clearly principles do matter – not just in business, but in everything we do. Yet how do we keep track of those principles, and express them in practice in everyday life? How we verify and ensure that we do keep to those principles? And how do we remember to remember them? Many, many stories, told and retold, returning, reminding – stories, perhaps, like those of the austere old man in that portrait above. Stories everywhere, everywhen, combined with a ingrained, in-built habit of storytelling and storylistening throughout our shared enterprise. Whatever you do – whether in your family, community or business – those principles do matter: spread the word with your Zahmoo story-bank. You collect stories; you tell stories; you use stories, in many different ways, in your family, your community, your business. But how do you manage those stories? How do you record them, keep track of them, link them, assess their meaning, veracity and value? How do you ensure that the right story is used in the right place at the right time? How do you ensure that you have the stories that you need, in making sense, in bringing people together, in connecting past and future? There’s a lot more to story than just the stories themselves – and it’s in managing these everyday story-tasks that a purpose-built story-bank such as Zahmoo really does demonstrate its value. To illustrate this, let’s say that you’re making a short documentary to tell some part of your family’s, community’s or business’s story – something that would typically link together a whole swathe of smaller stories to tell that larger story. 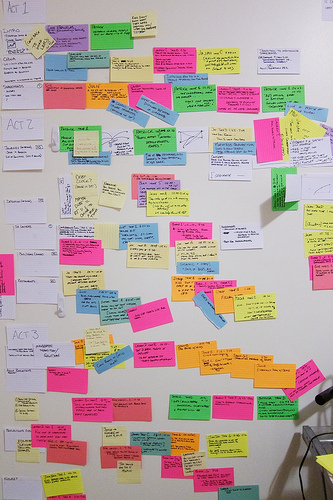 During the development-phase, you’d often expect to see something like this: a wall covered with sticky-notes that summarise story-fragments, organised into story-like sequences. That’s the surface part of story that everyone can see. It all looks good, it all looks easy, and it might even seem that there’s nothing more to story-management than that. And that might actually be true if there’s only one or two people involved, if it’s all coming straight out of people’s heads at that time alone, and if it can all be completed before the sticky-notes start falling off the wall – which is a lot of ‘ifs’… Reality is that for anything larger than what can be seen on that wall, you’re going to need a more systematic way to manage your stories! Such story-management tasks remain much the same regardless of the scale of the story – family, community or business. In fact, what matters here is that they are handled in a consistent way, regardless of scale – and, of course, that the story-bank does handle all of those tasks. And that’s what Zahmoo does. So whatever type of story-work you’re doing, use a Zahmoo story-bank to help you manage your stories, because it’ll free you to concentrate more on what really does matter most: the power of the story itself. Image credits: 024 by virtueel_platform under a Creative Commons BY-SA-2.0 licence; ‘Story-wall’ for Walking Merchandise by Rob Nguyen under a Creative Commons BY-SA-2.0 licence. No story, no sale. Simple as that, really. This is a bit old-fashioned now, I suppose, but my mum bought it when we moved to Salford, thirty years ago, and it’s been on her bedside table ever since. She always found it hard getting to sleep, especially when dad was away, so she often sat up in bed for hours, reading by the light of this lamp. It’s been a good friend to her all those years, and we hope it’ll be a good friend to you too. I’ve seen this sometimes with supposedly precious objects – paintings, jewellery, a book previously owned by some famous person, things like that. But these are everyday stories about everyday objects used by everyday people – and somehow much more meaningful for that. And more valuable, too. So how does your business, your community, your family, tell its own story through such objects? In what ways can you use such stories to connect, over time, across the generations? Use Zahmoo to help you capture and explore those stories – and build a story that people want to know. 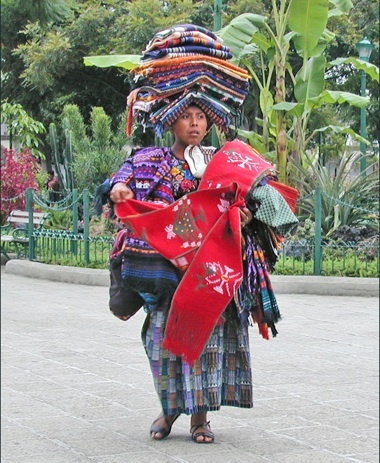 Image credit: Vendeuse des souvenirs by dalbera under a Creative Commons BY-2.0 licence. Hey @zahmoo. I have an unconfirmed story in my collection. What does that mean? How do I confirm it? In most cases, if you’re maintaining your own story-collections in Zahmoo, you probably won’t use the ‘Confirm story’ functions: the only thing you need to do is to remember to click the ‘Confirmed’ checkbox at the base of the story-edit form. If you’re an author, your story-edit form won’t include the ‘Confirmed’ checkbox. You’ll be able to review and edit your story, but you won’t be able to confirm it yourself. Dependent on how your editor has set up the story-list, you may see those messages about ‘Unconfirmed’ and so on, but just ignore them – that’s a task for the editor. The ‘Confirm stories’ button will show the number of stories that currently need to be confirmed (just one, in this case). Click on the ‘Confirm stories’ button to list all the stories that need to be checked and confirmed. This will show you a list of stories in the usual way, each of which will have the red ‘Unconfirmed’ as shown above. Bring your mouse down to the title-line for the story you want to check, and click on the ‘Edit’ mini-button that appears to the left of the title-line. This will open the usual story edit-form for that story. If you want to edit the story before confirming it, do so; then set the ‘Confirmed’ checkbox, and click on the Save button. If you just want to confirm the story without editing, click on the ‘Confirm story’ button (this will automatically set the Confirmed flag for you). If you want to delete the story – perhaps because it’s inappropriate, or incorrect – click on the Delete button. If want to leave everything unchanged – including the ‘Unconfirmed story’ status, click on the Cancel button. The story-author will see any changes that you make – including the change in status from ‘Unconfirmed’ to ‘Confirmed’. So what are your stories of time, or your family’s stories of time – of time lost, time gained, of time seemingly against you every step of the way – or perhaps, for once, seeming to be on your side? What difference did it make? What were the place, the people, the events? What happened, or didn’t happen, because it was the wrong time, the right time? And what happened after that? What is it that holds that story together – even now, maybe years or decades further on in time? In what ways did time itself seem different, or make a difference, within that story? Capture those stories in Zahmoo – and share them with others in your family, your community, your business. What do you learn from this as you do so? 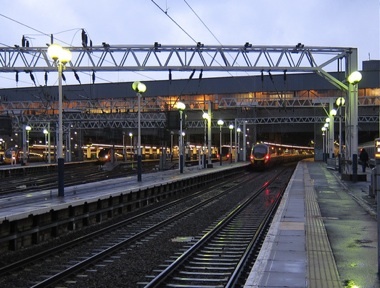 Image credit: Damp and dark at the start by shirokazan under a Creative Commons BY-2.0 licence. If you’re running a change-initiative, how do you know if that initiative has succeeded, and in what ways? Crunching the numbers can help, of course – but often the best tactic is through a story. What is the most significant change that happened since the initiative started? Why is this change significant for you? Capture these stories in your Zahmoo story-collection, in text, audio or video. Use appropriate tags to identify the respective region or other selector for filtering the stories. We encourage the group to read each story then argue why they think a story is most significant. This discussion helps embed the stories in the minds of the participants while raising issues of strategies and implementation. The participants experience a lively debate and get to know one another and the issues affecting people in the field. Most importantly they develop an intuitive understanding of the impact the initiative is having. In Zahmoo, tag the selected story as ‘most significant’ for this group, and add a comment that describes the reasons why it was chosen. Publish back to the region’s story-gatherers the selected story from each region, and the reasons for its selection. Step 3: Collate the selected stories from each region, and repeat Step 2 with groups of decision-makers at the next level. Again, the discussion is the most important part of this process, to underpin action-learning at each level of the organisation. As before, tag and comment in Zahmoo the story selected by each group as their choice for ‘most significant’. Repeat this step as appropriate with other groups and levels of decision-makers, usually until a single story is selected to represent ‘most significant change’ for the current stage of the change-initiative. Step 4: Publish the selected stories and the reasons for their selection – usually featuring the chosen story of ‘most significant change’. For example, this can be done by publishing the Zahmoo URL of the chosen story, complete with all the comments about why it was chosen at each stage of the selection process. Perhaps most important is to use these stories to guide action-learning and continuous-improvement by and for staff at ‘the coal-face’, as well as for executives and other key decision-makers. Rather than a one-off ‘event’, it’s usually best to make this a regular review-cycle to evaluate ongoing change. Intervals of 3-6 months are common, though some organisations will even do this on a weekly basis. However often you choose to do this, though, storing and commenting on the stories in Zahmoo will help you in this, every step of the way. 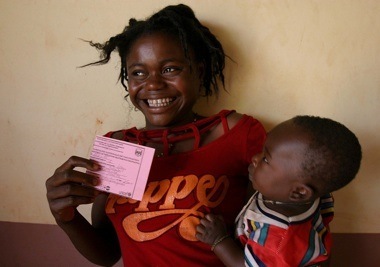 Image credit: Young girl and baby after vaccination by hdptcar (Pierre Holtz for UNICEF) under a Creative Commons BY-2.0 licence. I’m standing on the terrace of our temporary office in this small back-suburb of the city, in yet another country on this trip. It’s just turning dusk, and it’s a festival-day here – hence a good excuse for people to set off fireworks. Lots of fireworks: explosions and flashes and sparkling lights fill the skies all round. Across the road, a large burly man comes out of his house, accompanied by a gaggle of excited kids and, somewhat later, their mother. He drags out a bright paper effigy, upright in large cardboard box, almost into the middle of the street, and sets it ablaze. The kids squabble and squeal over the fireworks; two of the boys grab some of the larger ones to set off in the drains. Cars swerve past, seemingly heedless of the confusion, smoke and hazard. The box crumbles to flaky ashes; the fireworks are finished, the show’s over. The family go back inside, leaving charred detritus all along the street. And in turn a different, dark-skinned girl comes out, armed with brush and bags and hosepipe, and quietly cleans up the family’s mess. Yet it’s not just the maid that’s invisible: everywhere we look – if we remember to look – there’ll be other unacknowledged, all-but-invisible people. Who are they? What are their stories? Who are the ‘black sheep’ in your family-history, “the ones we don’t talk about”? Or the children who died young? The uncle or aunt who moved to another town, another county, another country, and seemingly vanished from family memory? What could their stories show you about your own deeper story? And who are the people working tirelessly in the background, almost unnoticed, within your community, your organisation? The sweepers and cleaners, the secretary, the librarian, the maintenance-man down in that dark dungeon of a sub-basement in your office-building – who are they, really? What can they tell you, that you can’t see right now from your own perhaps too-comfortable view? Use Zahmoo to help you capture the stories of these ‘invisible people’ – and renew your own story through what you learn from them.